The NAACP Legal Defense and Educational Fund has been fighting for justice on behalf of African Americans for the past 75 years. Started in 1940 by its first director-counsel, Thurgood Marshall—who would go on to become the first African-American Supreme Court justice—the organization has been the legal arm of the civil rights movement, fighting for justice, equality and advocacy across the nation. (Though it shares part of its name with the NAACP, the LDF has been a separate organization since 1957.) President Barack Obama has called the organization “the best civil rights law firm in American history.” Here are 10 of the many LDF cases that have changed racial justice in America over the past 75 years. 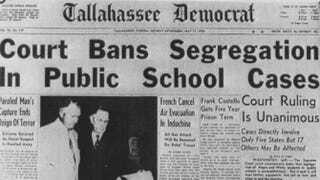 The case that led to the end of school segregation is the highlight of LDF’s legal legacy. On May 17, 1954, the Supreme Court declared that the “separate but equal” doctrine established by Plessy v. Ferguson in 1896 was unconstitutional. Brown v. Board of Education was actually five cases representing 13 plaintiffs in lawsuits against school districts in Kansas, South Carolina, Virginia, Delaware and Washington, D.C. More than 60 years after the landmark ruling, the struggle against resegregation continues. In Griggs v. Duke Power in 1971, Jack Greenberg, the LDF’s second director-counsel, represented 13 employees from the Duke Power Co.’s Dan River Steam Station in Draper, N.C. Duke Power had been discriminating against its black employees on the basis of race and underpaying its African-American employees. In its decision, the Supreme Court ruled that Duke Power was in violation of the 1964 Civil Rights Act. The court’s decision helped ensure that there are equal employment opportunities for individuals regardless of their race. In Smith v. Allwright, the Supreme Court ruled in 1944 that the state of Texas was in violation of the 15th Amendment by excluding African Americans from primary elections. Lonnie E. Smith, an African American in Harris County, Texas, sued for the right to vote in a Democratic Party primary, which challenged a state law that only allowed whites to vote in the primaries. Thurgood Marshall, who argued the case, called it one of his most important victories. Although the case was based in Texas, it had a major impact on race relations in the South and on African-American voter participation. Though Rosa Parks is the name most closely associated with the 1955 Montgomery, Ala., bus boycott, 15-year-old Claudette Colvin on March 2, 1955, became the first person arrested for refusing to give up her seat on a bus. Colvin and three other women—Aurelia Browder, Susie McDonald and Mary Louise Smith—were plaintiffs in Browder v. Gayle, a case that would ultimately lead to desegregation of city buses. The Supreme Court’s decision declared segregated seating on city buses unconstitutional and, in turn, ended the Montgomery bus boycott. In 1961 James Meredith was accepted to the University of Mississippi, but his admission was withdrawn once it was discovered that he was black. Jack Greenberg and LDF attorney Constance Baker Motley represented Meredith in Meredith v. Fair, in which a federal court mandated that the university allow him to enroll. In Williams v. Wallace, a federal court order allowed Martin Luther King Jr. and thousands of participants to take part in a five-day voting-rights march from Selma to Montgomery, Ala., in 1965. Civil rights icons Hosea Williams, John Lewis and Amelia Boynton were the plaintiffs on the case. Thurgood Marshall litigated Morgan v. Virginia in 1946, in which the Supreme Court struck down a law that required segregated seating on interstate buses in Virginia. The case was filed on behalf of Irene Morgan, who was ordered to sit at the back of the bus when she boarded in Virginia while on her way to Baltimore. Fourteen years later, the Supreme Court ruled in Boynton v. Virginia, also argued by the LDF, that the Interstate Commerce Act prohibits racial discrimination in restaurants and waiting rooms in bus terminals. After several states ignored the rulings, a group of civil rights activists launched the Freedom Rides on May 4, 1961, through the American South. In 1970 the LDF represented Muhammad Ali in Ali v. The Division of State Athletic Commission, the federal case that restored his New York State boxing license. The court’s decision said that the state of New York violated Ali’s constitutional rights by taking his boxing license after he refused to enter the military draft. A year later, the LDF also represented Ali in Clay v. United States, in which the Supreme Court overturned his 1967 conviction for refusing to join the military draft.